Asthma represents a global health and economic problem. It is a common and potentially serious chronic illness that can have a fatal outcome if it is not recognized and treated properly. Asthma is a chronic respiratory system infection involving many cells and cellular elements. That chronic inflammation is responsible for the appearance of symptoms in the form of wheezing in the chest, shortness of breath, pressure in the chest and coughing. Symptoms are most common at night and in the morning, before awakening. The severity of the symptoms is related to frequent but variable obstruction of the respiratory tract, which is often reversible, either spontaneously or with medication. To diagnose asthma, it is necessary to take a detailed medical history, to undergo a clinical examination and to prove the existence of obstruction of the airways, and the degree of reversibility of the obstruction by performing spirometry and ventolin test. Diagnosis is supplemented, if necessary, by allergological tests, FENO test, methacholine test, and other examinations depending on the clinical indication. The degree of severity of asthma is now determined by the intensity of the applied therapy to achieve good control of the disease. In treating asthma, the goal is to improve patient cooperation and thus reduce the progression of chronic airway inflammation, which can cause irreversible changes in untreated people. It is important to eliminate fears and prejudices, especially in parents of asthmatic children, where there is often fear of side effects of treatment with corticosteroids. It is necessary to avoid the risk factors that can be influenced, such as smoking, obesity and reduced physical activity, which certainly contribute to the progression of the disease. For each patient, a personal plan for treating asthma needs to be developed and together with the patient goals to be achieved in the treatment should be determined. Maintaining daily nasal mucosa hygiene with spraying solutions reduces the exposure of the mucosa to allergens and viruses as possible asthma triggers. Seawater saline solution intended for daily hygiene and removal of secretions from the clogged nasal cavities. Saline solution of the cleanest Adriatic seawater, enriched with d-panthenol (provitamin B5). 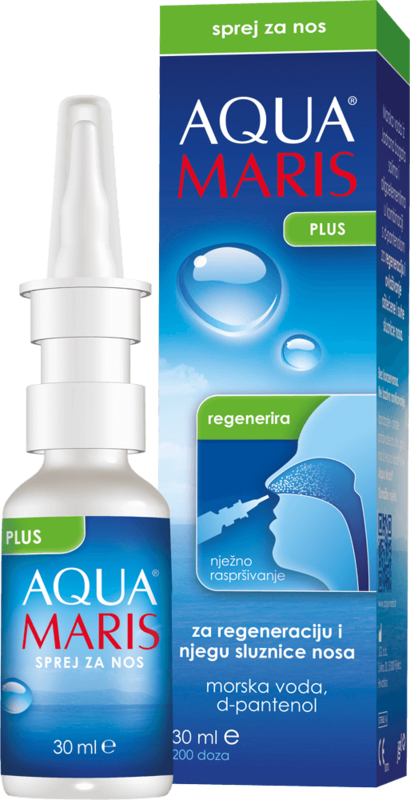 The combination of the natural healing seawater properties and provitamin B5 helps the regeneration of the nasal mucosa. It is recommended especially for smokers and people who want to quit, but also in other cases of damaged nasal mucosa, e.g., due to the frequent application of nasal drugs.